How's the weather where y'all are? It's been such a crazy winter here in Atlanta. A snow before Christmas and then another snow two weeks ago. NOT typical for our state at all!!! These cold days call for something warm and tasty to fill our families' bellies. 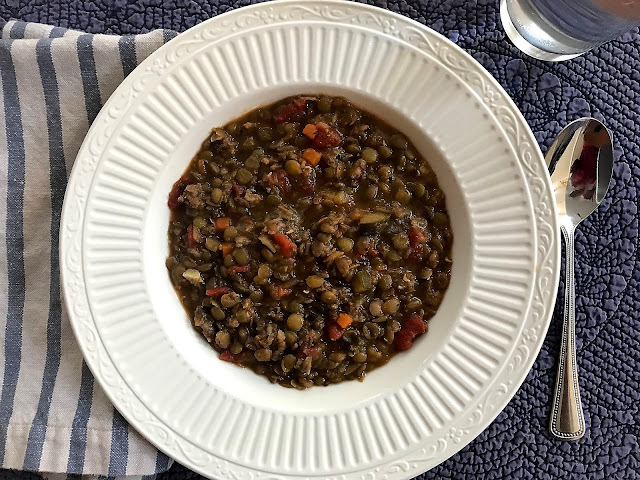 Eons ago, I shared a lentil soup recipe we really enjoy and it cooks up in the crock pot. SIMPLE!!! Today, I'm sharing yet another lentil soup recipe and this time it features hot Italian sausage- so SO good!!! Using a dutch oven or stock pot, brown sausage. Combine all ingredients and bring to a boil. Then reduce heat cover. Simmer for an hour, stirring occasionally. Serve each bowl with freshly grated parmesan cheese. This makes 8 hearty servings. OH!! 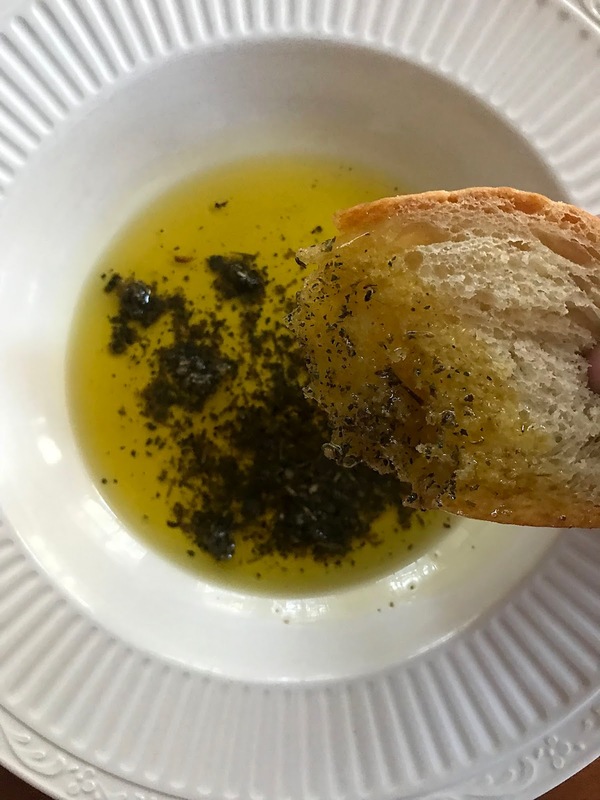 And if you want something super tasty to serve with your soup, buy or make some french bread and serve it with this DEEEELICIOUS dipping sauce!! Have you been to Carrabba's? They serve something very similar with their bread. A change from garlic bread, but really really good!!! Combine all the ingredients except oil and lemon juice in a small food processor or coffee bean grinder or use a mortar and pestle. Chop until all ingredients are about the same size. Stir in oil and lemon juice. To serve, combine about 1 1/2 teaspoons spice blend to 3 to 4 tablespoons olive oil on a small dish. Dip sliced bread in mixture. Y'all be sure and let me know if you try these out!! Recipes on my blog are recipes that I REALLY make for my family. These are all meant to be made by YOU in YOUR kitchen for the people you love. This is a great time of year to enjoy soup. Thanks for sharing what looks like a delicious recipe! Pinning. Looks amazing, perfect for a chilly winter evening. Saw your soup at Sarah's link party and couldn't resist! Looks soooo good. And I am in the mood for lentil soup now, so perfect. I wish we would get snow here in Florida, but no such luck! Hope you stay warm in Atlanta. We came up there during Irma and it was chilly! Thanks for sharing this delicious soup recipe on Foodie Friday! And the dip looks so good! This soup looks delicious! Love the bread dipping oil, too. Thanks for linking up to the Friday Frenzy! I love lentil soup! Thanks for sharing at Friday Frenzy Link Party! Pinned!! Thank you so much for sharing this on the Homestead Blog Hop. I love soup! and lentil soup is just delicious. Definitely going to try your recipe! Thanks. Oh gosh I LOVE lentils! Yummy. Pinned it! Thanks for linking up to the Friday Frenzy! Your Sausage and Lentil Soup is awesome and thanks so much for sharing with us at Full Plate Thursday. That is my kind of soup! Love bean soup & love french bread & olive oil. The only problem is I can't stop! This looks delicious! I love Lentil soup!